The Jenolan Caves are a leading example of impressive caverns in the Blue Mountains of Australia and are included in the Greater Blue Mountains World Heritage Area. They are regarded as Australia’s premier cave system and contain more than a dozen spectacular show caves, underground rivers and remarkable formations. It is considered one of the finest and oldest cave systems in the world. The caves are the most celebrated of several similar groups in the limestone of the country. They include numerous Silurian marine fossils of great interest, and the calcite formations, both richly colored and pure white, are of extraordinary beauty. Major portions of the caves have been rendered easily accessible and are well-lit. The Jenolan Caves are tucked into the lush vegetation of the Blue Mountains, a central part of Australia's Great Dividing Range, and are surrounded by rivers and lakes teeming with life, as well as by unique eucalypt vegetation and its associated communities. Small shawls and straws in the Jenolan Caves. The Jenolan Caves in New South Wales, Australia are a series of caves, tunnels, and caverns formed by two converging streams. 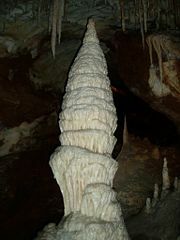 Produced by crystallization of calcite and aragonite from solutions which dissolved calcium carbonate while seeping through the limestone, the cave system includes speleothems (stalactites and stalagmites), straws, shawls, columns, helictites, calcite pool crystals, canopies, cave pearls and rim pool dams. Underground rivers have also played a part in enlarging and sculpting the caves. Some of the formations are pure white, while others display a rich red, brown or yellow color due to iron oxides and hydroxides. The caves are located on the western margin of the Blue Mountains, at an elevation of 2,600 feet (800 m), though on varying levels. By measuring the ratio of radioactive potassium and trapped argon gas, which was produced when the potassium decayed, scientists determined the age of the clay in the cave to be approximately 340 million years old, thereby making this cave complex the world's oldest known and dated open cave system. In 1999 geologists had estimated the age of the caves to be between 90 and 100 million years old. . Further scientific research is being carried out by the Commonwealth Scientific and Industrial Research Organisation(CSIRO) in association the University of Sydney and the Australian Museum. The entrance to Nettle Cave, circa 1888. Local Gundungarra Aboriginal tribes knew Jenolan Caves area as 'Binoomea' (Dark Places) and possibly shunned them; circa 1835-1840 the area was recorded for the first time by either James, Charles or Alf Whalan, three brothers who each claimed to have discovered the caves while searching for a bushranger, James McKeown, whom they claimed used the caves as a hide-out. One of the less-visited caverns in the area is called McKeown's Hole, however there is no actual evidence of his existence, and some believe that it is more likely the brothers were searching for cattle that had strayed from their nearby farm. The caves, then known as the Fish River Caves, came under New South Wales Government control in 1866, becoming only the second area in the world reserved for the purpose of conservation. The following year Jeremiah Wilson was appointed as the first "Keeper of the Caves." Wilson not only explored the already known Elder and Lucas Caves but later discovered the Imperial, Left Imperial (now known as Chifley), Jersey and Jubilee Caves. The caves were open to tourism early, but there was little protection from visitors damaging formations until souveniring was banned in 1872. In April, 1884, William Marshall Cooper, Surveyor of Public Parks for the State Government, was assigned the task of mapping out a new road plan in order to make the caves more accessible to the public. On a 10-day trek from Katoomba to the Caves he worked out a route covering 26.5 miles from the Western Hotel in Katoomba. He reported: "Anyone accustomed to walking can do it comfortably in 12 hours… when the proposed horse track is completed, it will be a very enjoyable ride of five hours." It became known as the Six Foot Track. Cooper also pointed out that "Fish River Caves" was a misnomer, the Fish River being on the western side of the Great Dividing Range and the caves on the eastern side. 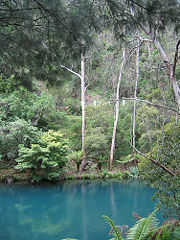 At his suggestion, the caves were officially named "Jenolan Caves" in 1884 after the parish in which they are situated. 'Jenolan' is an Aboriginal name meaning 'high place'. By 1885, Parliament had approved ₤2,500 for the construction of Cooper's bridle track, with the work starting at the most difficult area, the Megalong Cleft, where a zig-zag had to be cut, partly in solid rock, to reduce the grade to 1:5.5. The first recorded passage of the completed bridle track from Katoomba to Jenolan was by the governor, Lord Carrington, in September 1887. Lord Carrington also made the first official visit to the caves at the completion of his journey, accompanied by Wilson. In 1898 the current Caves House guesthouse was built, replacing the earlier wooden accommodation house built by Jeremiah Wilson, which had been destroyed in a fire. James Wiburd become "Keeper of the Caves" in 1903 and quickly discovered five more caves within eighteen months: the River, Pool of Cerberus, Temple of Baal, Orient and Ribbon Caves. He remained Keeper until 1932, when he left following a bitter dispute over the development of the Ribbon Cave for tourism. The Chifley Cave, originally known as the Left Imperial Cave but named for Prime Minister Ben Chifley in 1952, was the first of the caves to be lit with electric light, as early as 1880. In 1968, the Orient Cave became the first in the world to be cleaned, due to contamination from a nearby coal boiler. Steam cleaning was found to be damaging to the crystal formations, due to the rapid expansion and contraction caused by the heat from the steam. Following this, it was determined that when cleaning becomes necessary, water from the caves' own underground rivers is used. Large portions of this extensive cave system are accessible only to cavers, especially those areas along the underground river system; but, there are ten caves at Jenolan that have been developed for regular tourism. Lucas Cave: Discovered in 1860 and the most popular among visitors. The Lucas Cave (named after local politician John Lucas who pushed to have the caves preserved in the 1860s) features a number of large chambers including the Cathedral, over 50 meters high, and the vast Exhibition Chamber which contains the Broken Column formation. The Cathedral is also used for wedding ceremonies and recitals. The Cathedral Chamber, the highest Chamber within the Lucas Cave, is the venue for monthly cello and Gypsy music concerts, as well as other special concerts. River Cave: Discovered in 1903, the River Cave is the most extensive show cave at Jenolan and includes some of its most famous features, including the Minaret, the Grand Column and the Queen's Canopy, as well as part of the River Styx. Until 1923 when a concrete bridge was built, a section of river in this cave was crossed by a small boat. Chifley Cave: Discovered in 1880, the Chifley Cave was known as the Left Imperial Cave until 1952, when it was renamed in honor of the then recently-deceased former Prime Minister Ben Chifley, who grew up in nearby Bathurst. Two of the cave's chambers are decorated with colored lights. The Chifley Cave was the first cave in the world to be lit by electric light, having been illuminated this way in 1880. Imperial Cave: Discovered in 1879, this is the easiest cave to visit. The Imperial contains some of the best fossil deposits and several Tasmanian Devil bones. While fossils may not be clearly evident to the casual visitor, the bedrock in which the caves are formed is richly endowed with marine fossils. 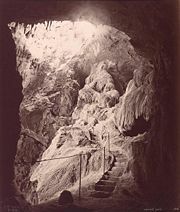 Orient Cave: Discovered in 1903, the Orient Cave was not opened to public inspection until 1917, to allow for the installation of electric lighting and paths. This cave contains some of the grandest formations in the complex. Until 1954, this cave, along with the Temple of Baal and Ribbon Caves, were only accessible through the River Cave. That year, the Binoomea Cut was constructed near Caves House to facilitate easier access to these caves. A high-tech LED-based lighting system is being installed. Ribbon Cave: Discovered at the same time as the Orient Cave, it was originally part of that tour but is now visited separately. The Ribbon Cave is only 60 meters long but is very richly decorated. Pool of Cerberus Cave: Discovered in 1903, this cave is a lower arm of the River Cave. The major formations here are the Bath of Venus and part of the underground river system that forms the Pool of Cerberus itself. This cave includes rare aragonite formations. Jubilee Cave: Discovered in 1893, the Jubilee Cave is the longest show cave at Jenolan. It is fairly remote from the other caves but offers formations of stunning beauty at close quarters. Of the caves shown at Jenolan to the public, it is the least visited due to the length of the tour and the small tour groups that can be taken there. Temple of Baal Cave: Discovered in 1904, the Temple of Baal Cave consists of only two chambers, one of which is dominated by the huge 9-meter shawl formation called the Angel's Wing. The cave is also famous for a high incidence of the peculiar formations known as Helictites. The name derives from the biblical story of Baal, and the feature names in the cave largely relate to that story. The cave has upgraded lighting and features an audio accompaniment to the cave-tour experience. Nettle Cave: The Nettle Cave lies between the Grand Arch and the Devils Coach House. The cave takes its name from the nettles which grow near its entrance (raised walkways protect visitors from their stings); an upper part of this cave can be seen from inside the Devil's Coach House. Originally shown as a guided tour, the cave was closed to the public in 1932. In December 2006, this cave was re-opened to the public as a self-guided audio tour, combined with the adjoining Devil's Coach House. The road from Sydney passes through the Arch, and six of the cave tours leave from assembly points within it. Adjacent to the Grand Arch is the Devil's Coach House, a vast open-ended chamber that forms part of the many nature walks in the area. High above both of these is Carlotta Arch, a free-standing arch that is all that remains of a higher cavern system long since eroded and collapsed. Along with these areas, there are several other caves in the area, some of which are available for special tours. Elder Cave: Named from the Elder tree, visitors would climb down to enter the sinkhole. Discovered in 1848, the Elder Cave was the first of the caves at Jenolan to be found and opened to tourists. It was later considered too difficult to develop adequately and tours eventually ceased; however in the late 1990s the Elder Cave was re-opened for adventure caving. It is not as well decorated as the regular show caves, but does feature signatures left by early visitors and includes a short section of the Imperial Cave. Aladdin Cave: The Aladdin Cave was first explored in the hope of developing a shorter path to the Jubilee Cave. It boasts an abundance of decorations not dissimilar to the Jubilee. Jersey Cave: An extension of the Elder Cave. One of the features is a fossilized thylacine (Thylacinus cynocephalus) skeleton. Arch Cave: This cave lies above Nettle Cave and part of it can be seen from the Devils Coach House. The entrance to this cave is at the base of Carlotta Arch (hence the name) and the stairs and locked gate can still be reached although the Arch Cave. ↑ Commonwealth Scientific and Industrial Research Organisation. July 25, 2006. Jenolan Caves 340 million years old: study Retrieved November 16, 2008. ↑ Government Gazette. August 19, 1884. ↑ W.M. Cooper, Surveyor of Public Parks. 1885. "Track from Katoomba to Jenolan Caves" published in Sydney, Australia. Copy at [nla.map-rm1826-s2-e] National Library of Australia. Australian Museum. 2004. Geoscience: the Earth Retrieved November 16, 2008. Colchester, D.M., Osborne, R.A.L., Pogson, R.E., Zwingmann, H. 2006. "Carboniferous clay deposits from Jenolan Caves, New South Wales: implications for timing of speleogenesis and regional geology." Australian Journal of Earth Sciences 53(3): 377-405. Dunkley, J. R. 2007. Jenolan Caves: guides, guests and grottoes. [Parkville, Vic. ]: Australian Speleological Federation Inc. in association with Jenolan Caves Historical and Preservation Society. Jenolan Caves Historical and Preservation Society. 1973. Jenolan Caves Historical and Preservation Society: smoke concert in the Grand Arch, Jenolan Caves … January 13, 1973. Jenolan Caves, N.S.W. : Jenolan Caves Historical and Preservation Society. Jenolan Caves Reserve Trust. Jenolan Caves Retrieved November 16, 2008. Wheeler, Joy, and H. K. Garland. 1969. Oberon-Jenolan district historical notebook. Barraba, N.S.W. : Wendy Rene. This page was last modified on 7 May 2014, at 16:26.